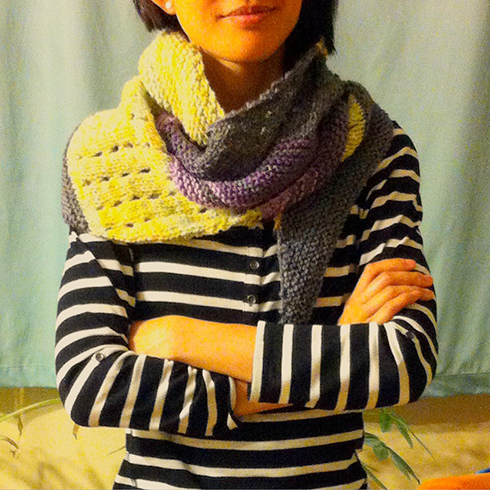 I found this lovely pattern on Ravelry by The Yarn Juice. 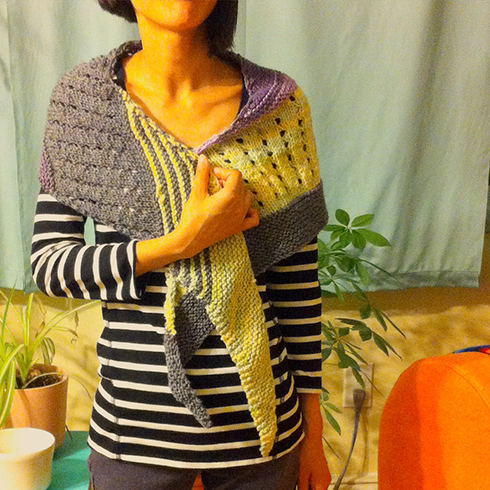 I’ve always been partial to sideways triangular scarfs with contrasting stitch patterns and colours. This pattern is perfect. 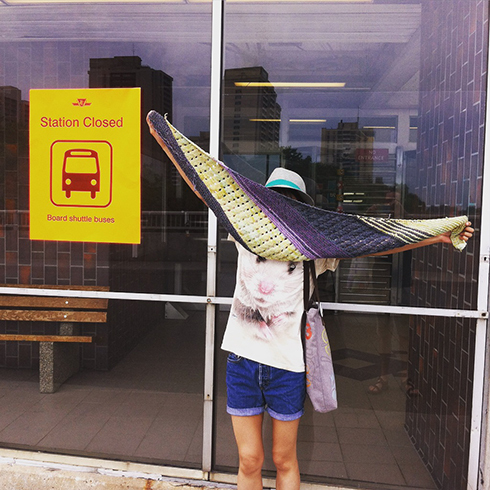 I started on Victoria Day holiday while taking the bus to my parents’. This makes waiting for the bus much more tolerable. On the streetcar to the beach! Post‐long weekend morning… but look, we got seats! This happens like once every 6 months. I’m really pleased with how the purple contrasts with the variegated lime/yellow yarn (which by the way I got in Halifax, hand‐dyed by East Anchor Yarns, and I’m so happy to incorporate it in something I can wear :D). 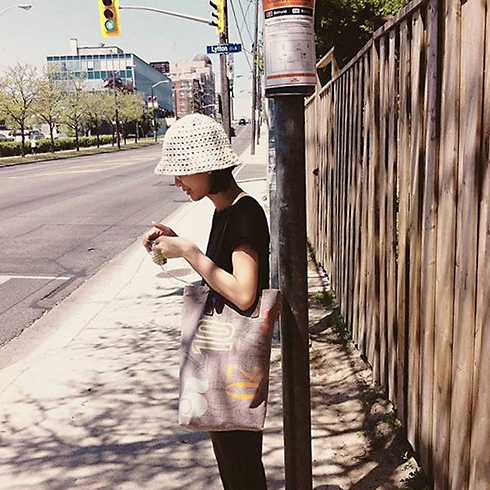 Fast‐forward to weekend again, taking the long subway ride to Scarborough Bluffs (more on that trip later). I’m really pleased with how it turned out. I love everything about it. I love all the different textures layered together when it’s wrapped around the neck. And it’s wide enough to drape over the shoulders. It’s far too warm to wear it right now but I’ll be sure to bring it with me everywhere comes this fall. I used worsted weight yarn and 6mm needles, rather than DK yarn and 5mm needles as called for in the pattern, because I have a lot of worsted weight scarp yarn. It’s really a great way to use up scarps. I think I will make another one as a gift. I also got to practice using circular needles, which I never really liked using. 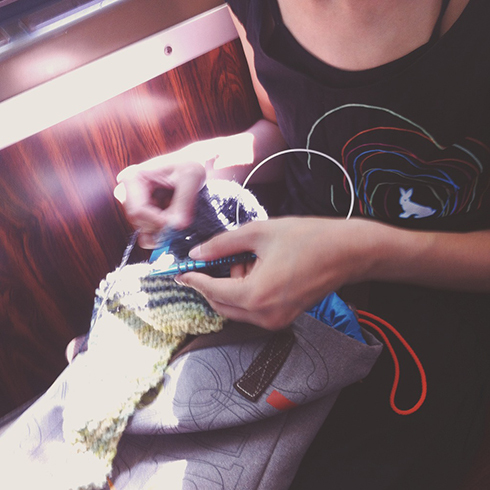 But it’s great for knitting in transit. Hope everyone’s having a good weekend! 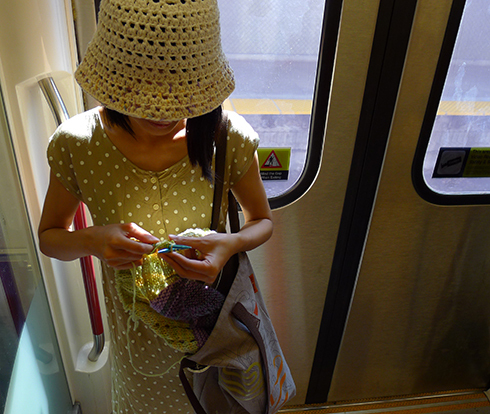 super idea, public transit can be so tedious…looks great on you! Thank you, Bee! 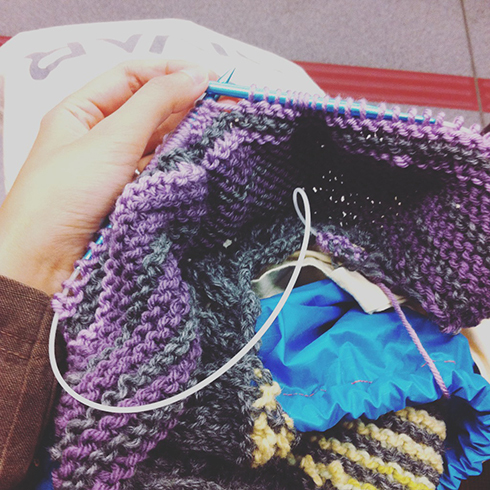 :D the knitting vastly improved my transit experience! Love the scarf, its beautiful! I also love your hat, did you make it?